Ya, I got the Vase this season. When does the FA Cup start? L9? I've been running the level 22 (advanced) file on its own and only running england and I been on holiday until Feb 2031 and I noticed the Carabao Cup ran for 3 years and hasn't been run since. Has anyone else had this? Also noticed the all the lower levels only appear to run every other season. This is very weird. This has not happened on my save and im in 2032 currently at level 8. Very weird indeed! I had this running all weekend on my computer at work and came back to it this morning. I'm trying it again from scratch to see what happens although I've not had chance to see if this happens on my home PC. So am I right with the following? There is a list of the English competitions, and there is a column saying "if selected division is at least". I then type in there the level I want. So for example, if I only want the Sterry Cup to feature at Level 11 or below, I type Level 11 into that box. Is that correct? So if I only select the top 8 levels for example, it won't be loaded. I have done this as seen below, but all the minor cups are still showing when I load level 8 and above only. What am I doing wrong? Not happened on my save either. I'm currently in 2031. How do you guys get through the seasons so quickly? I've found when having this file loaded that it runs quite slowly, but could be cause my computer isn't very good. A good computer will certainly help, I have disabled the very low levels as I have climbed the leagues as well. Promotion secured and decent runs in the cups. a) at what point in the file level are you able to get a parent club as well as an affiliate club? I watch all the league matches on comprehensive replay. I have the skin with the instant result button which I used for most of the cup matches - originally for all the cup matches except finals, now until the semis. 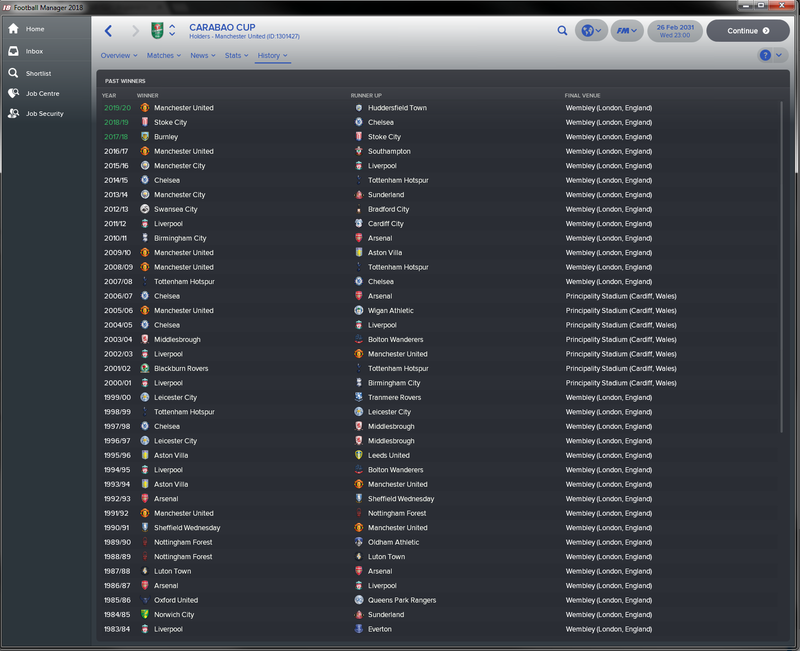 Now that I have FA Vase matches, I've played those on comprehensive as well. That competition pays better than the previous cup competitions so I take it more seriously. I have slowed down a bit now since there are 34 league matches this season (L10) compared to 18 when I started in L22. Oh and a fast computer - not just cpu speed, but ram speed helps as well. Promotion to vanarama national league south division via the playoffs, I failed to win the the league with 110 points, Gorleston have got some very good players and beat me twice. the debt levels are really rising now, £150,000 in the red with a bank loan of about £170,000 as well. I am getting a new stadium built named after me as the current one does not meet vanarama national league north/south standards. This is going to push the debt level through the roof lol. Moving into the dripping pan for next season while the stadium is being built. Why do teams, that play 7 levels below me, have a higher reputation than me? A quirk of the game - when a team gets relegated, their reputation gets set to 750 if it was below that to start. Also, B/C/D teams' reputation is set to some percentage of the parent team so their rep depends on their parent. Good thing this wasn't a league with only one promotion slot. I would've been peeved if I had a season that good and couldn't get promoted. Yes we was going at each other all season long, I lost some silly games near end of the season to teams in or near the relegation zone which effected the outcome in the end. Wondering if someone can help me. I’m currently in the middle of July 2019. I have won the Cheshire football league division one yet I haven’t been promoted nor have any fixtures for the premier division been released. The editor says that the winner gets promoted to the premier division but I’m worried that my save is dead and I won’t actuallly be promoted? 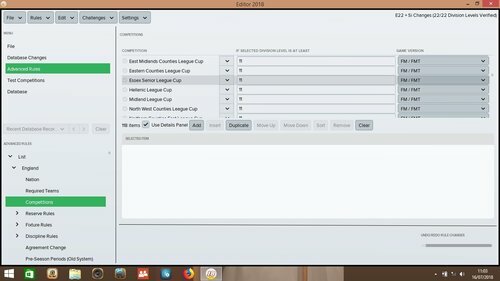 I've looked at the leagues in the editor and they seem ok. What club are you playing? Maybe it's something specific to the club? Not sure. What league does it show on your club tab, under your club name like below? If you click on the link for Division One, does it still show you in the table? In July? That doesn't seem right, as you've pointed out. What happens if you keep going? Do you end up in the same league again? Does the league not schedule any new matches? Beats me. No idea. Sorry. Do you have original game? Do you have 18.3.4 patch? Check version of this editor file- if you use some old version you can have issues? Do you use some other editor file with this in your save? The young striker that came up through my academy and wouldn't re-sign with me last season stayed with the club and played on a week-to-week contract for the same £110/wk as any other youth. He went on to lead the club in goals. Youth recruitment has been a bit disappointing the last couple seasons. I may have to look for some free transfers to replace some of the older players. I have two decent AMCs that did come through my academy so I changed my formation slightly to a 4312 narrow and alternated them. It worked to great effect - outscored my league competitors 110 - 18 this season. Yes I have the original game and I'm running on the 18.3.4 patch. 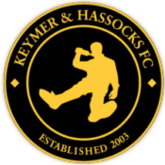 My level 9 Keymer & Hassocks club just played to a draw in the second round of the FA Cup to League 1 Bolton Wanderers. The only reason we didn't lose is because Bolton couldn't hit the broadside of a barn so we ended even with shots on target (5 each). They never even scored - I scored an own-goal for them. Doh! I doubt I'll catch them napping again during the replay. Update: We lost the replay 0-1 on an 85th minute goal after going down to 10 men on a red card. Going to have a crack at this. Was doing Messi's World Challenge but will have a short break to try this. Does anyone know of a really simple way of updating the Fairwarp Logo? Am tempted to add some of my local leagues (Thames Valley Premier Football League) but have no idea how to even start this in the editor. 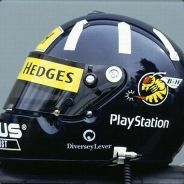 Anyone know of any good links for a noob? In the 2016 version of this edited game, a player signing with my top side then playing in the reserve side a few divisions down was not getting the division title added to their history at the end of the season. In this 2018 version, is that changed or is it still the same? The real Fairwarp logo (I think) is attached in the two sizes. I also made a custom logo and kits for my own save so thought I might as well put that up too. I have one question. I'm not sure if it's okay to ask here. I have tried to start the game with these editor file along with real fixtures of England leagues. But could not start the game. The editor files have red triangle with ! sign before them. Is it possible to start the game with two England editor file? No i think they conflict with each other. Is there an way to play with these two files? you have to play with one England file or the other, you cannot run 2 files from the same country at the same time. Thanks to a long run in the FA Cup and winning the FA Vase, I finished the season with a positive bank balance for the first time since turning professional. Plus, I was finally able to convince the board to upgrade my junior coaching again - it's been several seasons since they invested in any team infrastructure. I finally lost that young striker that came through my youth academy, but at least I was due compensation for him. I dipped into the transfer market to upgrade my midfield with a couple new MC's. I also signed a free transfer GK who is now my starter. Next season, I'll have to work on upgrading my defensive corps, probably through the transfer market since my youth intake was disappointing again. 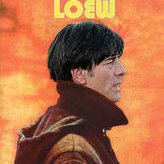 Oh well, the board gave me the luxury of a large transfer budget. May as well use it! Congratulations on winning the FA vase, I was unable to win it when I was in it. I have been in debt now for about 3-4 seasons now and trying to control it the best I can but the loan for the new stadium is crippling me a bit. 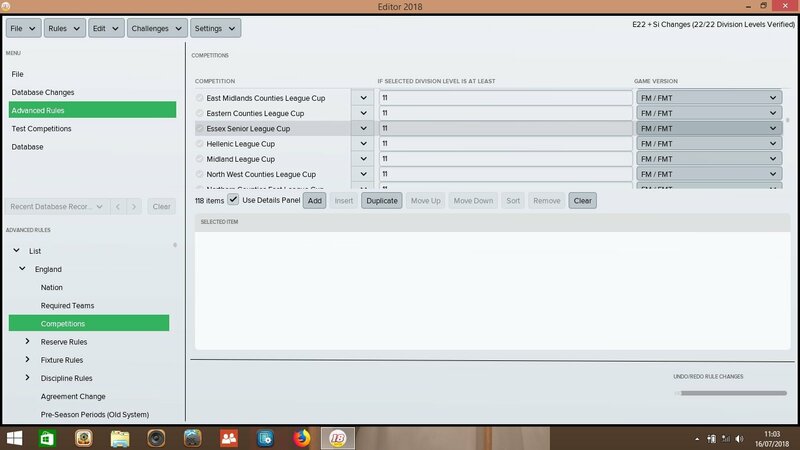 It's been a while since I last posted, I've decided, because I like being stressed, to do another Lower League Database for FM19 if I can get Level 7 & 8 to work out well! Promotion from national league south, 1 more promotion and we are in the football league. 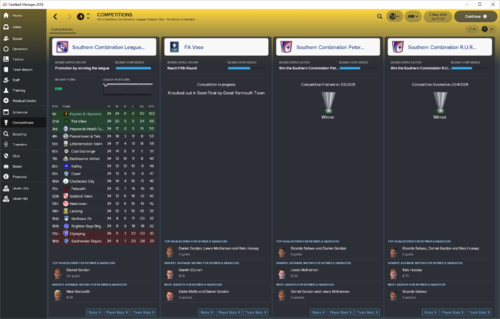 I should be due for our first stadium expansion when we hit the National League South to meet the stadium requirement. Hoping that the underwriter sugar-daddy covers it instead of taking on debt. They built me a new stadium of 4,000 capacity which I have just moved into, 1st game attracted 3,300 which im very happy with. I can only dream of those attendances at the moment. I'm averaging about 210 in league matches at the moment. My FA Cup matches are drawing about 750 though in the preliminary rounds. 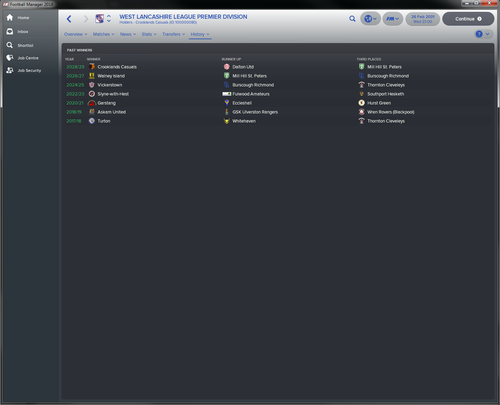 I did have my first sellout (1000) last season during the FA Cup replay against Bolton Wanderers.